Breakfast served at the hotel . Departure from your hotel at 08:30. Drive to Karatay Kervansaray on the legendary Silk Road. Stop at Kahramanmaras for lunch and a taste of its famous ice cream. Continue onto visit the world famous Gaziantep Mosaic Museum. This museums becomes after the discoveries from Zeugma. We will also visit the old city castle, copper bazaar and the famous baklava shop (Baklava is originally from Gaziantep). Overnight in Gaziantep. Breakfast served at the hotel . Urfa, the birthplace of the prophet Abraham. Urfa has been occupied since the Babylonians followed by the Hurrites, Hittites, Assyrians, Greeks. 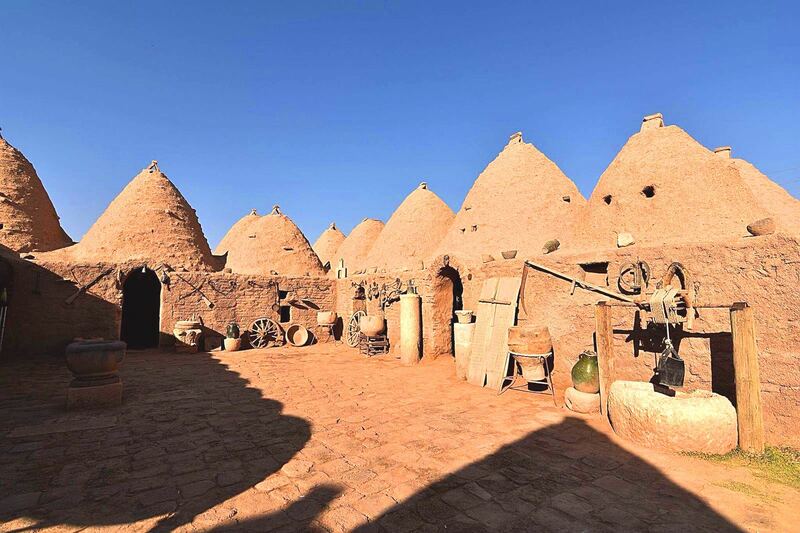 We will visit nearby Harran and see the incredible beehive houses. Harran according to the Bible was the site where prophet Abraham spent a few years with his family before moving on to Israel, the promised land. We will also visit the holy sites at the Ainzelha, a lake with millions of domesticated fish. While in Urfa we will visit the cave where the prophet Abraham was born and visit a bustling sheep market as well. There are exceptional photo opportunities in this area. In the afternoon drive to Kahta on the way see the Ataturk Dam, third largest in the world. Overnight stay in Kahta. In the morning 03:30 am departure. Hike to the summit of Mt. Nemrut (one of the most popular UNESCO world cultural heritage sites), watching the sunrise, be amazed by the colossal heads and statues of ancient deities as you step into mythology. This extraordinary landmark rests at an elevation of 8000 ft. The mountain top complex is composed of two flattened areas strewn with statues and separated by a false peak of crushed rock. Antiochos built the entire complex approximately 2000 years ago as a monument to his divine ancestry. Also definitely take time to visit the old castle Arsemeia, cross over the still functioning Cendere Bridge (Septimius Severus bridge) dating all the way back to the 3rd century and Tumulus Tomb of Karakus. Then drive back to the hotel for breakfast. We then depart to Mardin with a lovely ferry ride across the dam and lunch in Siverek. We will reach Mardin around 16:00 check into hotel. We will take the time to visit, walk in its busy streets and bazaars, and admire the stonework all around the town. Overnight stay in Mardin. Breakfast served at the hotel . In the morning visit Mardin. Mardin is very unique with lovely old-Arabic style houses. The houses are often decorated with intricate carvings. This is a very lively trading center with people coming from surrounding villages to buy and sell. We will have a fantastic view of the Plain of Mesopotamia. It is a city that played an important role in the early development of Christianity. We will also visit the Monastery of Deyr-az-Zaferan just outside of town, founded in 762 A.D. It was the seat of the Syrian Orthodox Patriarch for almost 800 years.We drive to Hasankeyf, with stop at the beautiful little town of Midyat to see the Monastery and ancient houses on the way. Hasankeyf, with its history that spans nine civilizations, the archaeological and religious The history of Hasankeyf goes back 10,000 years. This is three times longer than the Giza pyramids, 10 times longer than Stonehenge, and makes the glorious civilizations of the Maya and Inca seem as if they were flourishing just yesterday. Some of the city's historical treasures will be inundated if construction of the Ilisu Dam is completed. These include ornate mosques, Islamic tombs and cave churches. After lunch by the Tigris River we depart to Tatvan, a small village on the edge of Lake Van and watch the sun set over the lake. Overnight stay in Tatvan. Breakfast served at the hotel . Depart from Tatvan and a beautiful drive around the lake to reach Van city, established 13th century BC. From here, we will take a ferry across the lake to visit the finest Armenian architectural wonder of the Church of Holy Cross on Akdamar Island. Step over to the huge Van Castle from the days of Urartu and see the hieroglyphs as you sense the spirit of the once Urartu capital Tushpa, feel the salty waters of the great Lake Van called as 'the Sea' by the locals. Overnight stay in Van. Breakfast served at the hotel . Drive on the "Silk Road" to Dogubeyazit. At the Iranian border we will see a site known as the Crater Hole. This is a beautiful, yet rugged area. We will have the opportunity to see Mt. Ararat from all sides. It is believed by some to be the resting-place of Noah's Ark; but to date no one has found anything that has been verified as the Ark - yet the search is still on. We will stop and see the Ishak Pasa Palace. This complex is a combination of a mosque, a fortress, and a palace which originally had a room for every day of the year! Below you can also see the remains of Eski Beyazit, and Urartian City which flourished in 1000 BC. Continue onto Kars. Overnight stay in Kars. Breakfast served at the hotel . We begin a beautiful 5 hour drive to Trabzon, winding along the rivers with many photo stops and Karaca Cave along the way. Visit the Sumela Monastery, also known as the Monastery of Virgin Mary. It has been said that it is neither on earth nor in heaven. Carved on the slope of a mountain, it looks like a nine storey high building hanging down from the clouds and sitting on the top of the forest. A short hike through the rain forest will leave no question in your mind about where you are in Turkey. The Black Sea Region ! Overnight stay in Trabzon. Breakfast served at the hotel . Visit the city of Trabzon in the morning. After the crusaders invaded Constantinople in 1204, Trabzon became the capital of the Byzantine Empire for a short time. Longing for the grandeur of Constantinople, in Trabzon, they imitated the churches of their beloved city in a smaller scale. St. Sophia of Trabzon though much smaller will leave with you the same sense of religious devotion as the original one in Istanbul. Fly back to Istanbul . After arriving transfer to hotel in Istanbul .